Words that we will never hear again will continue to resonate the caustic hypocrisy of Tory politics. ‘We’re all in it together’, a piece of flagrant brazenness when it was first trailed by Osborne in 2010, has now become a millstone around the Tory neck. Everything they have done in the last two weeks contradicts their pretence of shared sacrifice, and this is not an impression they will find it easy, or indeed possible, to shake off. What is exposed is not so much the absurdity of the original claim as the arrogance that led them to believe they could get away with it. Putting a grannies tax for millions of the poorest pensioners next to a £3bn pay-off for multi-millionaires isn’t just a crass misjudgement, it’s a sign of such overweening confidence that Osborne & co thought they could get away with anything. Their class myopia is unravelling the Tory project fast. Thatcher got away with it because she was brutal and made no bones about it that she was engaged in class war in conquering the unions. This clique have taken an entirely different tack by adopting the patent falsehood that we’re all united in some equal pain for a common purpose. The sheer monstrosity of this pretence is now laid bare at every new initiative – not just the ubiquity of pensioners, but the ‘premier league’ dinners at a quarter million a head at one end of the scale though to the price of takeaway pasties jacked up by VAT on food, from Tory Cabinet Ministers profiting from the budget to those on only three-quarters the national average wage losing £77 a week in tax credits. Class was always the Tory Achilles Heel. 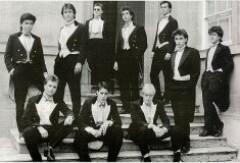 A government led by an Old Etonian, ex-Bullingdon Club member who married into the aristocracy, led by two public schoolboys who have no idea what it’s like to have to cut down on food (and who don’t care either), trying to palm off austerity-as-never-before as a shared enterprise, was always a set-up for a fall. When this abiding impression of moneyed insouciance is then combined with the studied cynicism of trying to panic the nation with gerry cans in the garage, hubris cannot be far from nemesis. Despite all the talk of the Tories re-toxifying the brand, in the last analysis it’s not the ‘nasty party’ image that will bring them down; it’s their unerring capacity not to get it, their instinctive tendency to do the wrong thing, their inability to hid that so far from being ‘all in it together’ they’re not actually of it at all. Can Osborne really believe his own propaganda? ‎”what you have to realise about the Conservative party is that it is a coalition of privileged interests. its main purpose is to defend that privilege. And the way it wins elections is by giving just enough to just enough other people.” A senior Tory quoted in Owen Jones’ book, Chavs.